City Link Tracking. Delivery Tracking System for City-Link Express MalaysiaEnter City Link Express Shipment Tracking Number. Do not use spaces or other (+ - / * ? & = ! ') characters. After clicking on the "Track" button on the left, you will be directed to the tracking result page on Aftership. This page creates just a link automatically for requested information with form restructuring. The most common tracking number format is a combination of 15 numeric characters (15 digits) (e.g. 0000 0000 0000 000). Some other less common formats may also exist. Online Tracking Numbers COM never makes logging and does not use CityLinkExpress's any of the information system definetly. City-Link Express provides package courier and freight (air / ocean) domestically in Malaysia. 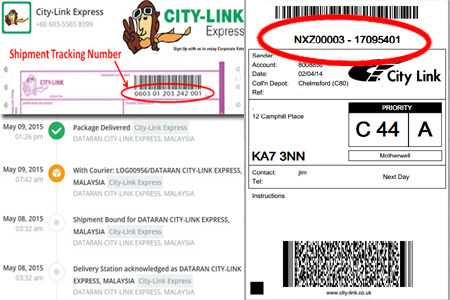 City Link Tracking, You can find a shipment no at the voucher that you get from City Link Malaysia, by your shipment. You can follow your post. Tap the shipment no on the site and immediately see where your package is at the moment, day to day. Package tracking is achieved by redirecting your inputs to related City Link tracking service query addresses. Your private information such as your tracking numbers, cookies, session information are not logged in our site. If you have any question regarding the delivery process of a package, call: +60 603-5565 8399. Courier Companys automatically assigns a tracking number to your shipment. Tracking numbers are numbers given to packages when they are shipped. Tracking numbers are useful for knowing the location of time sensitive deliveries. City Link Tracking numbers are used by CityLink to identify and trace shipments as they move through the CityLink system to their destination. By log in your City Link Tracking number can you your package ID by entering the detailed information online following, you can know where your package is at the moment. Online Tracking Numbers COM is a third party, all in one solution for tracking shipments. You can track your deliveries easily by using our web site. We committed you that in no way we does not record your any information belonging. Notice : All delivery product and company names are trademarks™ or registered® trademarks of their respective holders. Use of them does not imply any affiliation with or endorsement by them. Online Tracking Numbers COM is a third party, all in one solution for tracking shipments. The postal companies, the services of these couriers and the above mentioned trademarks are the exclusive property of their respective owner. This website does not work with one of the above mentioned couriers. So they have no connection. We committed you that in no way we does not record your any information belonging. If you have any questions about this website, please contact with CheDhoung (at) yandex.com. If you have any questions regarding a courier service, you should contact the postal service itself.